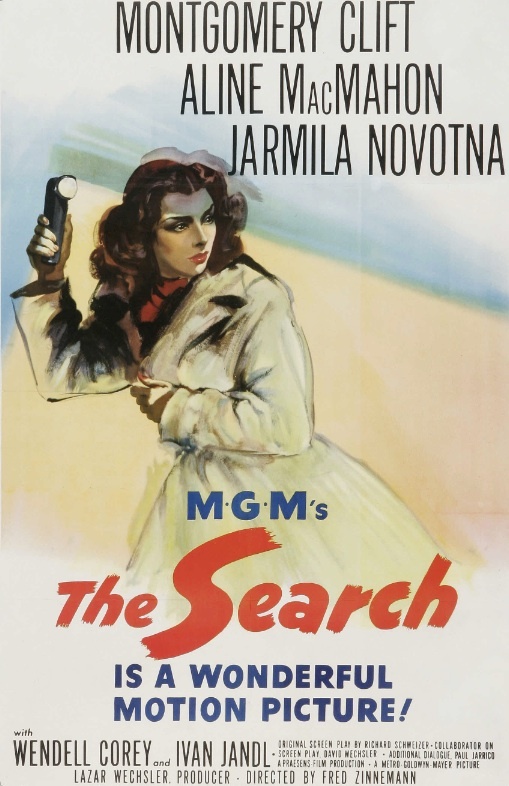 Fred Zinnemann’s The Search premiered in New York City on March 23, 1948, and went into wide release on March 26. It wasn’t the first film the slim, haunted-looking heartthrob Montgomery Clift starred in, but since the release of Howard Hawks’s Red River, filmed in 1946, was delayed due to legal troubles until August 1948, The Search was the first film many moviegoers saw him in. Clift doesn’t appear until more than 35 minutes into the picture. The first section of the film follows a group of emaciated, frightened children liberated from concentrations camps and then processed through U.N.R.R.A. (The United Nations Relief and Rehabilitation Administration). U.N.R.R.A. is in place to help the children, but after years of living in a state of fear, they’re unable to trust adults wearing uniforms. These scenes involve a mixture of languages with no subtitles. The important details are conveyed with voiceover narration in the style of a documentary. When the children are being transported in ambulances to a new location, one of the ambulances has a broken exhaust pipe. Gas leaks in, and the terrified children break through the glass in the rear doors and escape. Two of the kids, Karel (Ivan Jandl) and his French friend, successfully evade the U.N.R.R.A. soldiers but then are separated when the French boy crosses a river. Before the Nazis invaded Czechoslovakia, Karel’s family — his parents and his sister — led the happy life of intellectuals, reading and playing music together. But now little Karel carries a tattoo on his left arm from Auschwitz while his mother (Jarmila Novotna) wanders desolate German highways, searching for her son. She lost her husband and daughter during the war, and she desperately clings to the belief that her son is still alive. Much of the exterior footage in The Search was filmed in the American zone of West Berlin, and it has elements of the German “Trümmerfilm” (“rubble film”), a style of filmmaking that began with Wolfgang Staudte’s 1946 film Die Mörder sind unter uns (The Murderers Are Among Us) and that used the desolated, bombed-out post-war landscape of Germany as a backdrop. The emotional core of The Search is the relationship that develops between the nine-year-old Karel and American G.I. Ralph Stevenson (Clift). Slowly but patiently Stevenson gains Karel’s trust and helps him come out of his emotionally shellshocked state. Ironically, he tries to help Karel accept the fact that his mother is dead when she is in fact alive. The Search is a beautifully made, emotional drama that’s fairly restrained. It would have been easy for director Zinnemann to be manipulative, but he trusts his actors. 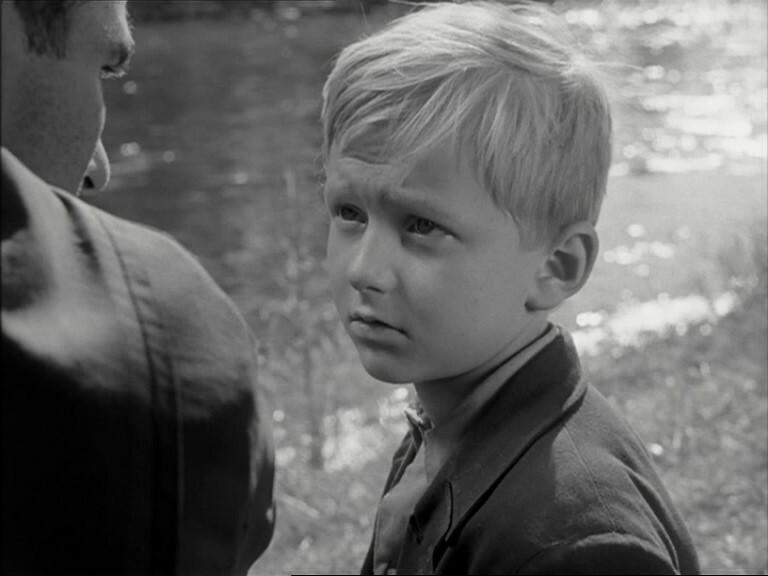 The character of Karel could have been a real disaster if an adorable Hollywood moppet had played him, but Ivan Jandl was really Czech, and he brings as much authenticity to his role as Clift does to his. Clift’s character also could have been a stereotype, but he’s completely believable as a typical young American. 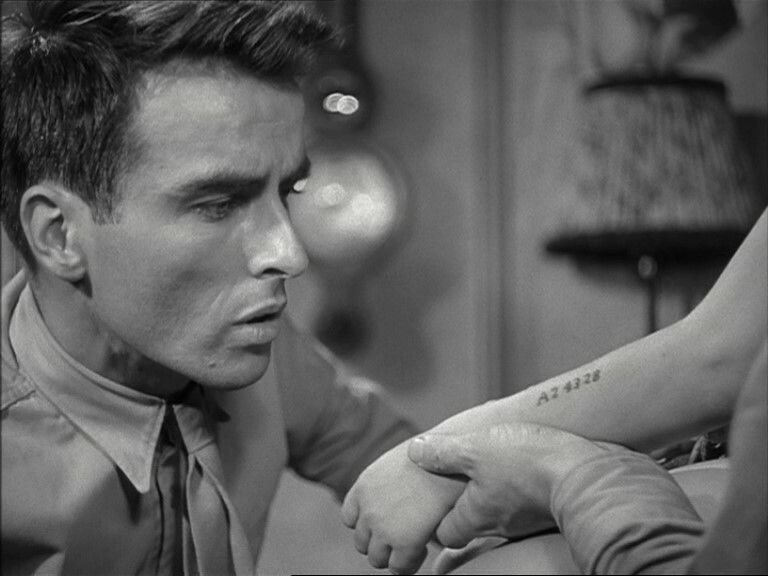 The Search was nominated for four Academy Awards — best director for Fred Zinnemann, best actor for Montgomery Clift, and best story and best screenplay, both for Richard Schweizer and David Wechsler. Ivan Jandl was given a special award for outstanding juvenile performance. Posted in 1948, March 1948 and tagged 21st Academy Awards, Aline MacMahon, Fred Zinnemann, Ivan Jandl, Jarmila Novotná, Metro-Goldwyn-Mayer, Montgomery Clift, Wendell Corey. Bookmark the permalink.